Plot: A Prince is accused of a crime he didn't commit and is betrayed by the ones he knows as he is sent into slavery. He rises to the top to gain his revenge. Charlton Heston stars in this classic historical epic as a jewish prince betrayed and condemned to death by a Roman tribune. It's one of his defining performances and he charismatically heads a great supporting cast in a well written if overlong tale of revenge and redemption. It takes a little too long to get going, and the subplot involving his mother and sister is melodramatic nonsense, but when Chuck is on the warpath it's great, and the chariot race is a scene every movie lover should see. Not as good as Spartacus, but still one of the best examples of the genre. One of the biggest and most classic epics. I liked the second half better, though. Having viewed this again as an adult one can truly appreciate the beauty of this picture. A wealthy Jew named Judah Ben-Hur (Charlton Heston) and childhood Roman officer Messala (Stephen Boyd) have disputes due to different beliefs. Ben-Hur's mother and sister Miriam (Martha Scott), and sister Tirzah (Cathy O'Donnell) became peasants during the reign of Messala and was tendered by Esther (Haya Harareet), a daughter of a loyal servant. 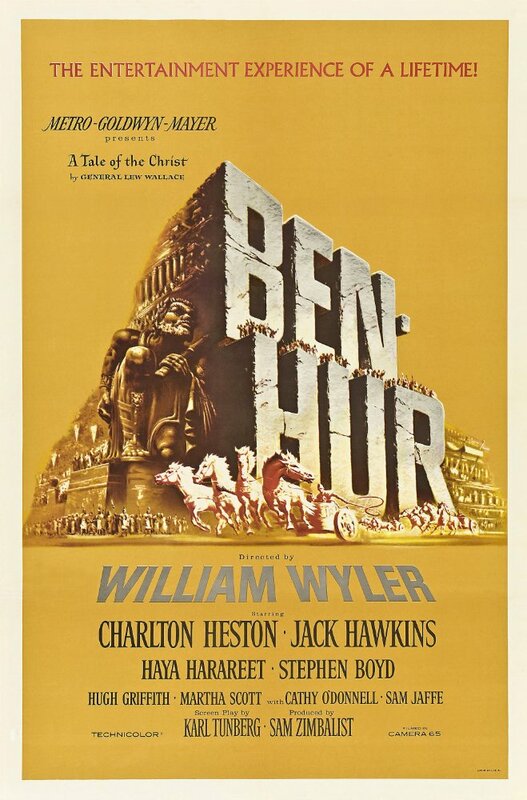 Ben-Hur encounters Jesus Christ twice. Had tremendous action sequences and enormous cast and set pieces without the aid of advanced computer graphics. Performances were realistic and screenplay and score were endearing. Epic that will stand the test of time. After Judah Ben-Hur (Charlton Heston) is betrayed by his friend Messala (Stephen Boyd), he is sent into slavery. While on his journey for revenge, he meets Jesus of Nazareth (Claude Heater), which later becomes a vital part of his journey in the Best Picture winning "Ben-Hur." I remember a few years ago when Mel Gibson released "The Passion of the Christ" and everybody thought it was THE religious movie. After watching �Ben-Hur,� I wonder if any of them had sat through the 3+ hours and understood the masterpiece. I also wonder how anybody could like that garbage that Gibson passed off as being spiritual when all it was was a gorefest for simple-minded Christians to see, but that's for another review (maybe I'll do that one next Easter). No posts have been made on this movie yet. Be the first to start talking about Ben-Hur!